With every new owner, a house undergoes some change, whether it’s a major addition or simply a new paint job. In the home of Christine and Frank Crist, the changes can be marked by adjustments in the family dynamics. With four youngsters, their house was full. As the children grew up and moved away, rooms were altered. With the addition of another child, rooms were changed again. The result is a new home within the old. While its spirit has remained the same, the home has taken on a new life. Frank and Christine Crist’s home is situated along a farm road in a still-rural area of Forest. It was planned as a traditional brick country home with lots of interior wood paneling, and was perfectly suited for a large family. 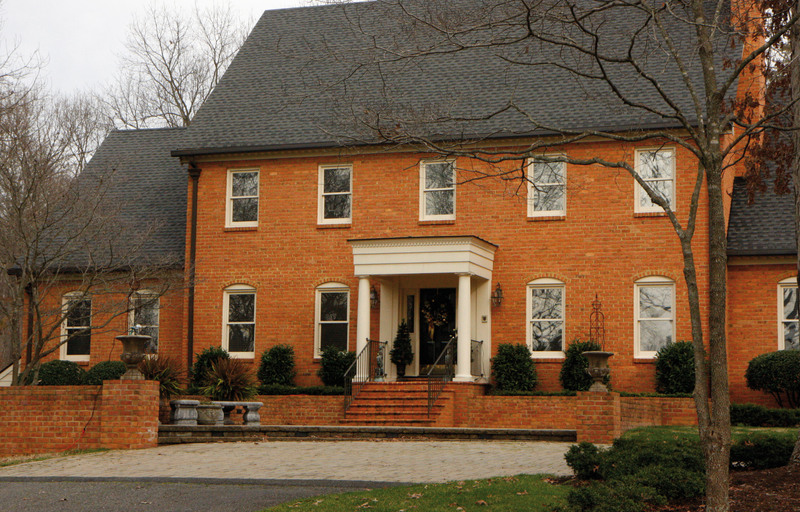 As the older children began to move out and live on their own, the Crists initiated some major home projects resulting in a more elegant style. This is most evident at the driveway. A front entrance courtyard greets visitors. Stylish urns and a wreath of greens and magnolia blossoms decorate the entry. Like most homes, the kitchen is the center of the house, which they renovated in 1999. “Originally the cabinets were all knotty pine,” said Christine. The couple was looking for a more modern, upscale design. “We wanted something that looked more like furniture than big cabinets,” she said. And the result is a cook’s dream. 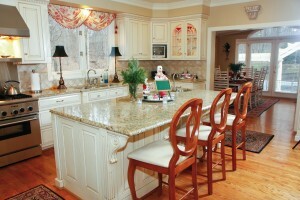 Ivory cabinets and a large center island contrast with the granite countertops. Double windows over the sink provide the extra light so necessary in a kitchen. All this plus superior appliances make it a kitchen any cook would find irresistible. 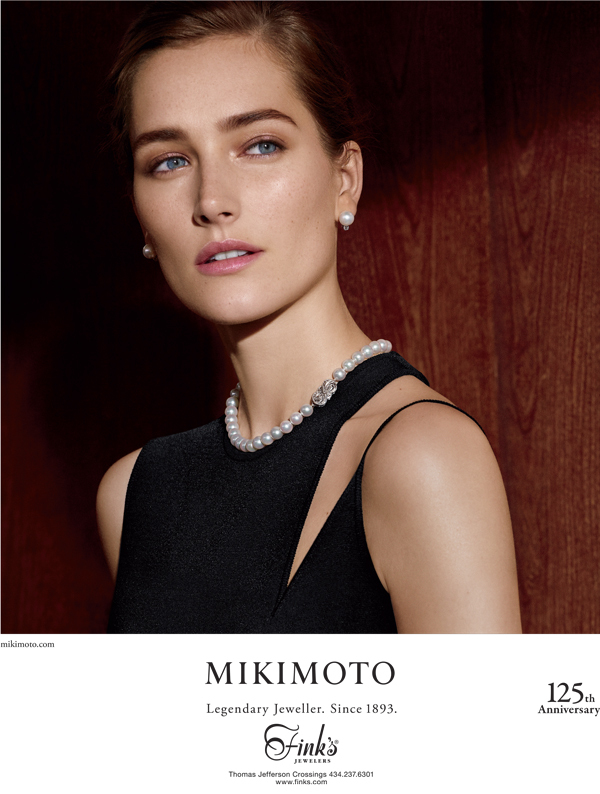 “My husband loves to cook and gets every cooking magazine that’s published,” said Christine. Today their kitchen suits Frank perfectly. A one-time porch just off of the kitchen is now an inviting breakfast nook. “We designed it,” said Christine, explaining that Ronk Cabinets and Furniture helped them with the kitchen. Expansive windows create a bright and cheerful atmosphere. Tones of red are carried throughout the room, including in the Oriental carpet and checkered seat cushions on the ladderback chairs. A brick wall serves as the backdrop for a lovely pine hutch with a natural wood finish. The table is set in the holiday spirit with Santa, greens, and wine-colored goblets at every place setting. Currently a small laundry is located directly off of the kitchen, but this will eventually become a butler’s pantry. A new laundry and a garage on the first level are in the couple’s future plans. Once the new kitchen was completed, there was a disparity between this room and the rest of the house. The Crists decided to redecorate and renovate the remaining main floor to achieve a more consistent look. The kitchen, music room and den all connect, so it was especially important that these three rooms flow together. The music room includes a baby grand piano and a sitting area opening directly into the den. Today the den is striking, a brightly lit room with an eye-catching fireplace. Originally this was a plain brick fireplace. Thanks to Frank’s design and artist Sonny Harlow, it has been transformed. Sonny faced the brick with a stone-like material, and added a mantel and molding. 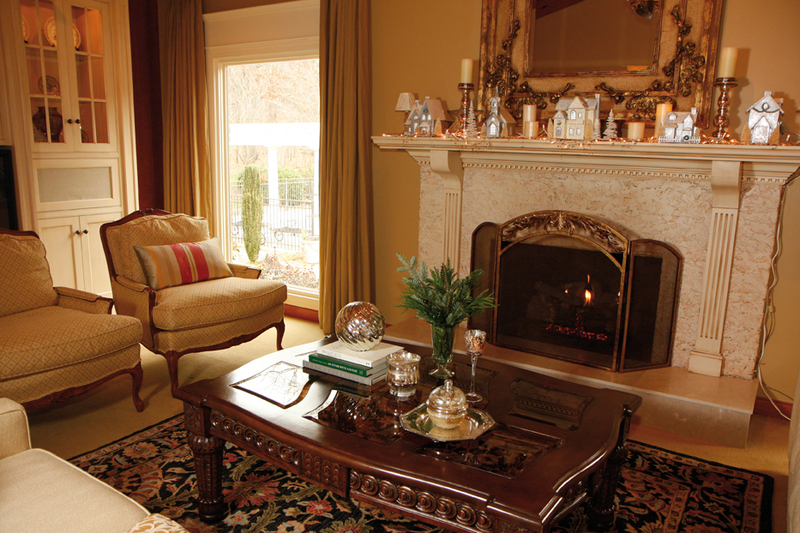 With the addition of a raised marble hearth, the fireplace is now the room’s centerpiece. For the holidays, the mantel is decorated with a village glowing with white lights, and a large decorated tree stands in the corner. A massive ornate mirror hangs above the mantel. When Christine first saw it she was not sure that it would suit the room. But now she simply cannot imagine it any other way! On either side of the fireplace are large windows with commanding views of the water garden. As an art teacher, Christine has a natural eye for design. “I kind of moved from paper and paint to bigger things,” she said. Now she enjoys decorating both inside and outside. Christine likes contrasts. Her style is discriminating and eclectic. 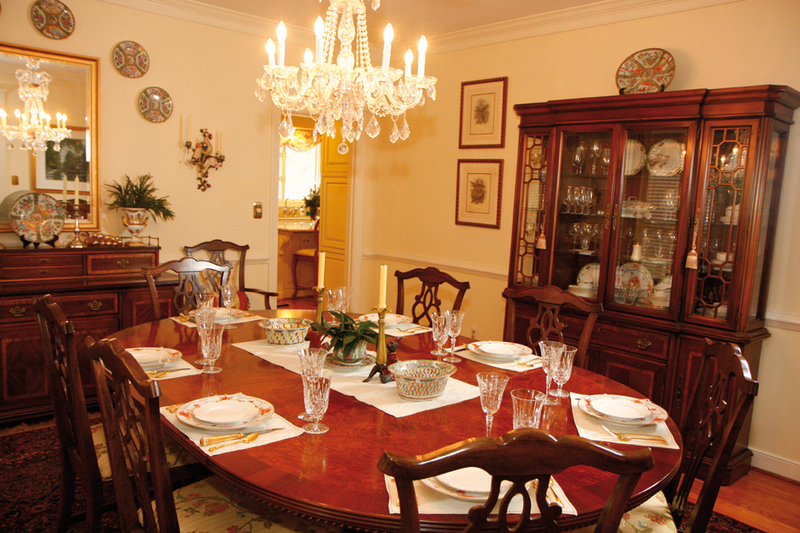 An elegantly appointed dining room with a crystal chandelier is the perfect place for Christine to display her beautiful collection of rose medallion china. And throughout her home, Christine displays a collection of art. She finds the work locally and on the couple’s travels. Another addition to the family prompted more renovation projects. “In 1993, we adopted our daughter,” said Christine. Her arrival was quite sudden and the couple quickly set up the master bedroom with a crib. It stayed that way for two and a half years. The children’s bedrooms had been on the second story, and by then all the children had grown and left the family home. They could not put a two-and-a-half-year-old in a vacant second-floor bedroom. Instead they renovated the first floor and added a master bedroom, using the old bedroom as their daughter’s room. As she got older, the Crists wanted to give their daughter more privacy, so Christine moved her upstairs. Then they initiated another renovation to open up the downstairs and update the master suite. The entry hall, with its elaborate wrought iron and stone table overflowing with greens and larger-than-life pinecones, serves as an introduction to a long corridor leading to the master suite. The addition of a chair rail, Oriental runner and painted grasscloth transformed this simple area into an elegantly appointed passageway. “We took some formal spaces and opened them up,” explained Christine. Breaking into a hall wall exposed the living room, and allowed access to this cozy area made a bit more formal with an Aubusson rug. Today both the hall and the living room are brighter and more open. Their daughter’s original bedroom, which adjoins the master bedroom, became the Crists’ library. Here, Frank stores his huge collection of cookbooks. The room also houses one of Frank’s prized pieces, a cellaret purportedly fashioned from wood taken from the ship of Lord Nelson. Cellarets were popular in the 19th century for keeping wines and champagne cold. Lined with tin, they were a very early version of today’s wine cooler. One of the last rooms to be renovated was the master bath. According to Christine, originally the entire room was wood from floor to ceiling. They removed some of the paneling from the walls and took up the original flooring, then replaced the wood with tile and marble. This dramatically changed the look from country to classic. Christine’s stone choices were perfect, picking up the earthy colors of the natural wood grains. The effect is light and updated. Curtains, Blinds and Bath worked with Christine on shutters for the skylight and windows, allowing control over light and privacy. 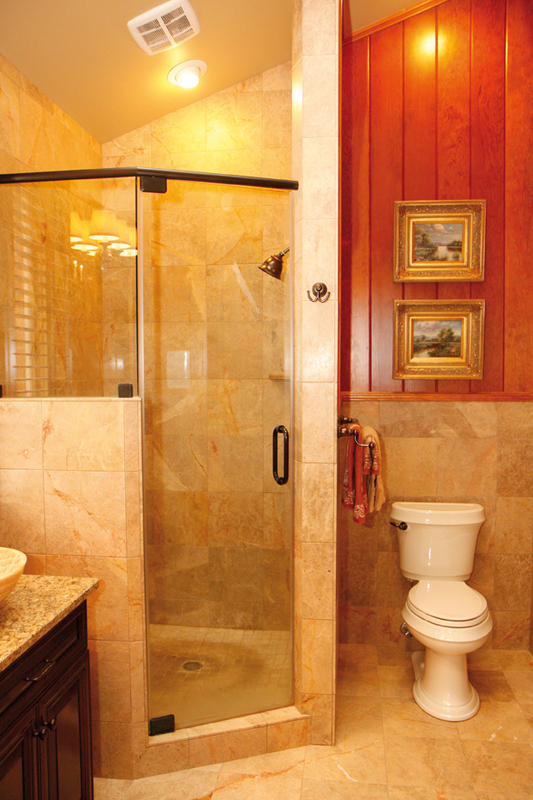 “Now, instead of closing the French doors that lead into the master bath, we keep them open!” said Christine, also noting that guests often compare the look of this bath to the island-inspired style of Tommy Bahama. 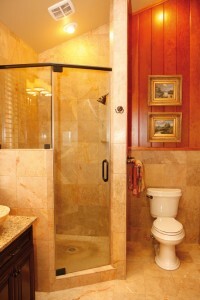 The hallway leading from the bath to the master bedroom is covered in a soft-colored coral grass cloth. A tiny dressing room is complete with a small vanity and sink plus a very feminine chandelier. Excellent lighting and mirrors make this the perfect little room for adding the finishing touches when dressing. In keeping with the décor of this wing, the master bedroom is flawlessly fashionable. Heart pine floors with area rugs and salvaged doors create a cozy room. Tray ceilings are painted a French blue with contrasting chocolate brown walls. Christine does not like the stark effect created with bright lighting; instead she uses indirect lighting and lamps. A simple four-poster bed and a beautiful antique desk decorate the bedroom. “I saw this desk at Status Symbol Antiques but had no place to put it,” explained Christine. “Then one morning I got up and suddenly it dawned on me that the best place for it was facing the bed.” That convinced her to buy the piece. In an area that was once a small stoop, Frank envisioned the perfect smoking porch. So the Crists created an inviting little covered spot with black wicker chairs where Frank and his guests can escape for an occasional cigar. The water garden has been a work in progress. According to Norman Tharpe of Water Garden Designs by Tharpe Landscaping, he met with Christine initially to discuss the installation of a spring and small pond. The Crists had the perfect location on a small hillside behind their home. 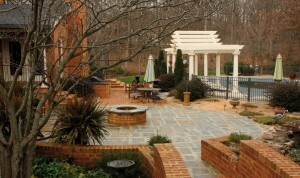 Over the years Tharpe expanded the garden feature. Today there is a large pond, additional waterfalls and over 80 feet of stream. Tharpe worked with Christine to add a variety of plantings along the water line as well as numerous walkways. The result is a beautiful garden complete with enormous koi that live year-round in the pond. Nearby a heron decoy stands guard. One day Christine spied a real heron in the garden. Concerned that it might dine on her beautiful koi, she followed expert advice to set out a decoy to deter other herons from approaching. It seems to have worked, fortunately for her fish! Another outstanding feature on the exterior of the home is a beautiful bluestone patio complete with fire pit, created with the help of Southern Landscape Group. Today the Crist house is alive again with the sounds of children and grandchildren. Dianne Mowry explained that now the home is more comfortable and blends a mix of both contemporary and traditional styles, creating a functional and family-friendly atmosphere. And Frank is already thinking he will need a bigger kitchen for everyone. “I think a house always evolves with the children,” said Christine. This home certainly has evolved, and with each change it has just gotten better.